December 4-10 marked a time when millions of students internationally took a moment to appreciate the power behind computer science and its impact on the world. Computer Science Education Week, sponsored by Code.org—a website where one can learn how to code—aims to teach kids the basics of coding through fun activities and games. Whether it’s programming Elsa from Frozen to catch all her snowflakes or making a cat flip hamburgers, kids learn concepts like loops, a concept that allows a piece of code to repeat over and over again; conditionals, which are equivalent to if-then statements, and basic debugging techniques all in one hour of coding. Code.org aims to reach out to underrepresented minorities and females through their coding activities. Since 2013, Code.org has inspired and encouraged an interest in computer science in over 344 million students, half of them being either female or underrepresented minorities, through the implementation of their international Hour of Code during Computer Science Education Week. Central’s Computer Science Club chose to celebrate the week by trying out many activities related to coding and computer science. Virtual reality (VR) is a computer generated simulation where one can see a three dimensional image or environment in a seemingly real or physical way using VR headsets. Schools across the U.S. have started to incorporate Virtual Reality into education by bringing the lessons to life. One can take a field trip virtually anywhere, whether that may be taking a tour of the Great Wall of China or the Great Barrier Reef. ”The VR devices were a great opportunity to help people imagine the possibilities of how VR can contribute to multiple occupations like medicine, engineering, and even just for entertainment,” said the president of the club, Ao Wang (278). VR has been used to enhance the training experience for a growing number of fields like architecture and interior design. Using VR in education not only saves money but also breaks language barriers. Google has been incredibly involved with bringing more computer science into education worldwide. Have you ever opened your default browser (in this case Google) and found Google’s letters displayed, not in their usual red, green, blue, and yellow colors, but rather in an artistic design meant to reflect a cultural or historic theme? That’s what Google calls their “Google Doodle”. 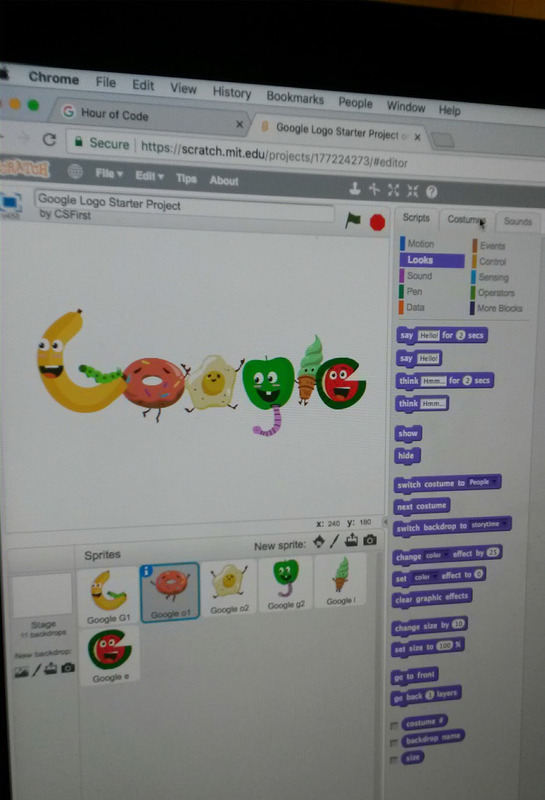 The CS Club chose to reflect Google’s growing efforts to bring more computer science education to young people by creating their own Google Doodles, using a block-based coding platform known as Scratch. Scratch allows one to move colorful “blocks” of code around to program a “sprite” or animated character to do something, whether that’s moving around the screen or making the character constantly change color. Overall, the club had fun showing off their creativity as they customized their very own Google Logo. Over the past several weeks, the CS Club has also been teaching each other Python, a programming language commonly used in creating robots and video games, through a website called Tech-Smart Kids. Recently, the club has been learning about strings, which are a sequence of numbers or letters; concatenation, which prints two strings as one string; and print functions, which print out strings when the program is run. “Learning how to code seems like it would be difficult to learn but in reality, it isn’t hard once you get a hang of the basics. It’s really fun to write a program and see it run. At least for me, every time I successfully do something new in code, it feels like a large accomplishment,” said Seth Green (278), a member of the club.